It's going to be a weird sight when Jim Thome steps back into the batters box at Jacobs--whoops, now Progressive--Field for the first time in almost a decade. #25 would have been on a statue and a banner in right field had Thome decided to stick to his word and not let his uniform be "ripped off his back" back in 2002. 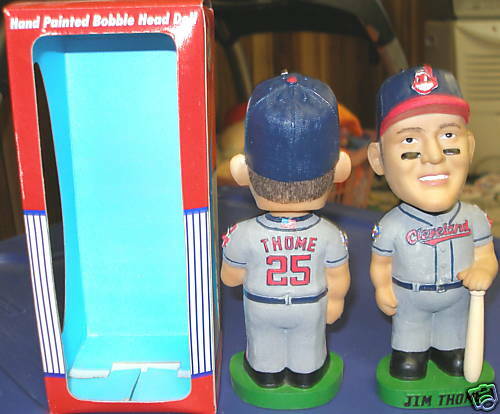 But he made his choices, and I'm sure, while he will get his cheers, there are a number of true-blue Indians fans who will find it very hard to root fully for Thome. Not to mention our very own Ryan. 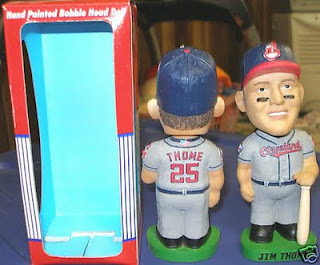 Jim Thome is no longer out of the box new. That being said, I don't know how to feel. The Thome defection was a true stomach punch. I had taken him at his word, and truly felt, like many Indians fans, that Thome was a true Tribe legend. The brass thought so too, as they never offered a statue to Dion James, after all. But I never bought into the pure hostileness that many fans did. I guess I saved that for TGiM. Regardless, this Indians season has turned into one of disbelief-slash-unbridled-joy into one of disbelief-slash-injuries-and-losing-streaks. The Indians have somehow gone from being 15 games over .500 in May to one game under, as of this morning. Ridiculous. Much of that has to do with injuries. Travis Hafner's first trip to the DL coincides almost directly with the losing ways, and between then there was Shin-Soo Choo, Grady Sizemore, Carlos Carrasco, and now Jason Kipnis. Among others. It's getting to be a joke. It's not unrealistic to think that the Tribe would still be in first place if it weren't for the preposterous number of injuries. But even with the burgeoning infirmary, as of last week, the Indians went into Detroit trailing by only 1.5 games. The previous three months had been an endless stream of frustrating losses, shockingly bad offense, and inconsistent starting pitching. The infusion of (rumoured) talent at the trading deadline hasn't paid off yet (to put things mildly.) But still, only 1.5 games out. And then, six losses (vs. one win) to the Tigers and Mariners later, and the Tribe is 6.5 games out. And in deep deep trouble. It certainly isn't over. But Travis Hafner is out again, maybe for the season. The sun is setting on the 2011 Tribe. The Indians need to score runs. And some of that will need to come from a 40-year-old DH who spurned us 9 years ago, and whose sun is setting too.